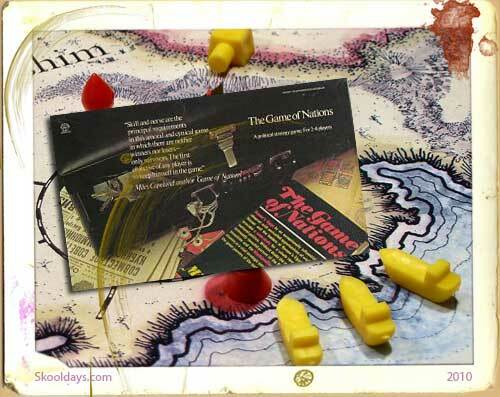 Players travel as mice from one end of the board to the other, moving in a turn based manner guided by a six sided die, supplied with the game. 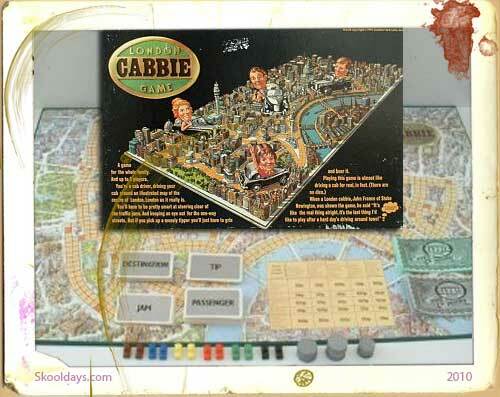 Upon landing on a square, they either retrieve a piece of cheese, or assemble a piece of a complex mouse trap contraption that is the game’s namesake, and which was inspired by the work of Rube Goldberg. The contraption has gears, a marble which rolls from end to end down a miniature staircase, ramps, rubber bands, a diving man, and ends of course in a mouse trap, specifically a dome-shaped cage which clatters down a toothed pole. Upon reaching the end of the board, all players travel in a circle, ending up underneath the ‘net’ of the trap, or on a space to ‘trip’ the trap. Operating the contraption requires a piece of cheese, gained earlier. The object of the game is to build the trap, and to trap the other mice. 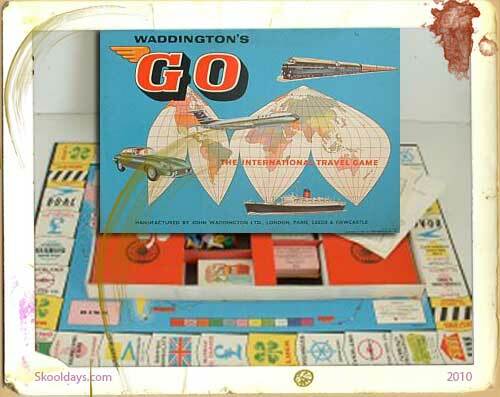 The original version, designed by Marvin Glass and Associates, allowed the players almost no decision-making, in keeping with other games for very young children such as Candyland, The Game of Life, or Snakes and Ladders. However, the unpredictable nature of the trap mechanism means that the game has an additional layer of sophistication that makes the game far more interesting than others where the chief randomizing agent is a pair of dice. 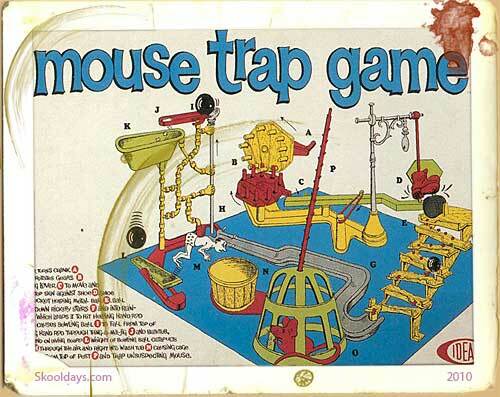 In the 1970s, the board game surrounding the Mouse Trap was redesigned by Sid Sackson, adding the cheese pieces and allowing the player to maneuver opponents onto the trap space. This description accompanies the illustration on this same page. The player turns the crank (A) which rotates the gears (B) causing the lever (C) to move and push the stop sign against the shoe (D), which tips the bucket holding the metal ball (E) which rolls down the stairs (F) and into the pipe (G) which leads it to hit the rod held by the hands (the hitting of the rod is probably the most difficult and frustrating area of the mousetrap’s design, leading often to the mousetrap not succeeding) (H), causing the bowling ball (I) to fall from the top of the rod, roll down the groove (J), fall into and then out of the bottom of the bathtub (K), landing on the diving board (L). The weight of the bowling ball catapults the diver (M) through the air and right into the bucket (N), causing the cage (O) to fall from the top of the post (P) and trap the unsuspecting mouse (i.e. the player who occupies the spot on the board at that time). The game designer Marvin Glass (and his company, Marvin Glass and Associates) refused to pay licensing fees or royalties to Goldberg, despite Marvin acknowledging being inspired by Goldberg as well as the clear similarities between the game and a Goldberg drawing. 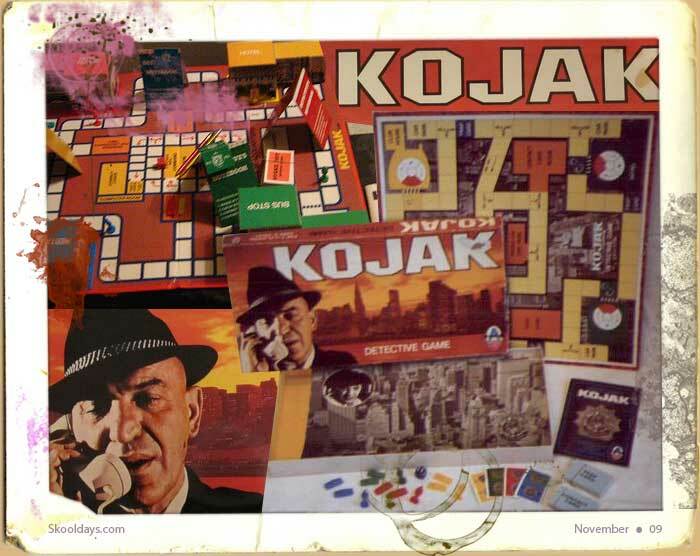 Glass went on develop two less well-known games based on Goldberg designs, [[Crazy Clock]] (released 1964) and Fish Bait (1965), neither of which credited Goldberg’s influence. 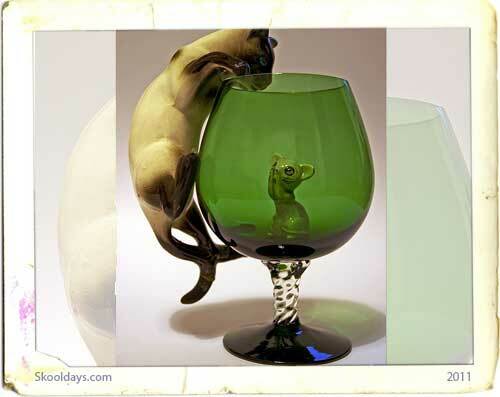 Elderly and near retirement, Goldberg declined to take legal action against Glass and chose to sell licensing rights for his drawings to another toy company, Model Products instead. 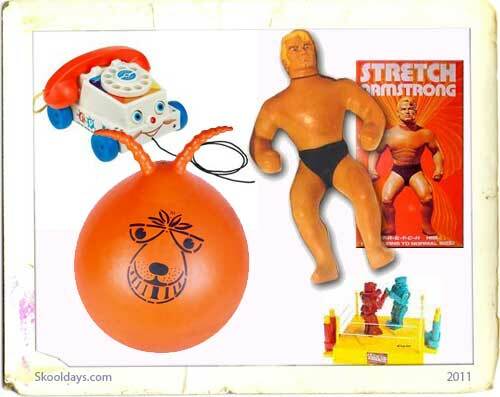 This entry was posted in Toys and tagged 1960, 1970, 1980, 1990 by Skooldays. Bookmark the permalink.